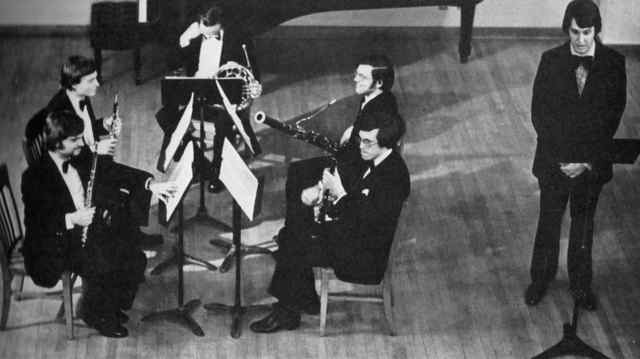 Forty years ago this month, Eric Draper approached David Tessmer and Jim Whipple – all of whom were playing in the Carnegie Civic Symphony (now the Pittsburgh Civic Orchestra) about starting a wind quintet. Adding Eric’s friend and classmate from Duquesne University Mike Jacob on clarinet and hornist Mark Thompson from Carnegie Mellon, the Renaissance City Woodwind Quintet was off and running, and gave their first performance in an elementary school in Chartiers-Houston School District that fall. Later that season, the group won the Pittsburgh Concert Society Auditions. Shown here is the group with baritone Rob Ferrier performing one of their winning selections, the Pügesange by American composer Brian Holmes, on the Concert Society Series the following season. By this time Jeffrey Ellrod had taken the place of Mark Thompson on horn, who had moved away to attend graduate school. Just look at all that dark hair!